Hollywood often shows all of the fire sprinklers in a building going off at the same time in movies. The scenario of a bad guy pulling out a lighter and holding it up to the fire sprinkler to set them off in order to escape the building probably seems familiar. These types of glamorized movie scenarios lead people to believe this is the normal function of a fire sprinkler system, however, this is not always the case. Do all fire sprinklers go off at once if there is a fire? This is somewhat of a trick question. Typically, the answer is no. However, there is one type of system where all sprinklers will release water simultaneously. This system is called a deluge fire sprinkler system and is fairly uncommon. When you own or manage a property protected by fire sprinklers, it’s important that you understand what type of system you have and how it functions. The buildings shown in the Hollywood movies most likely would have a wet pipe system or a dry pipe system, as those are the two most commonly used fire sprinkler systems. A wet pipe system is by far the most common and affordable sprinkler system to install. The overhead piping is filled with water at all times. When a fire occurs and the heat activates the sprinkler, water immediately sprays from the sprinkler that was activated. It is important to understand the water will only spray from the sprinkler that was activated by the heat sensing mechanism. You should not find this type of system in buildings or structures where temperatures will drop to 40 degrees Fahrenheit or below due to freezing risks. Dry pipe systems still use water to suppress the fire, however, the pipes are filled with pressurized air or nitrogen until the system is activated. A valve separates the dry fire sprinkler pipes from the main water supply piping. In the event of a fire, the heat will activate the sprinkler, which causes the air pressure to drop in the pipes. Once the pressure drops, the dry pipe valve opens up and releases the water, which will only flow out of the activated sprinklers. Due to the design, there will be a delay from when the sprinkler is activated to when the water reaches the sprinkler. This type of system is great for buildings or structures that are exposed to freezing temperatures, such as parking garages, loading docks, walk-in refrigerators, etc. Deluge fire sprinkler systems use an open piping network and open fire sprinklers. An open fire sprinkler does not have a heat sensing element. Instead of using a heat sensing element to release water, a deluge system is connected to a releasing panel. When the releasing panel is activated, it sends a signal to open up the deluge valve. Pilot sprinklers, smoke detectors, heat detectors and optical flame detectors are just a few things that could trigger the releasing panel to release the deluge valve. Since the piping is open, meaning no water or air is present, water will rush through the pipes and out of all the sprinklers once the deluge valve is opened. Deluge systems are commonly installed in hazardous areas such as chemical storage and processing facilities, power plants, and aircraft hangers. This system is best for protecting buildings that are at risk for rapidly spreading fires. If you own or manage a property that is protected by fire sprinklers, contact Koorsen Fire & Security. Our fire sprinkler experts can keep your system up to code with inspections, tests, and repairs as needed. 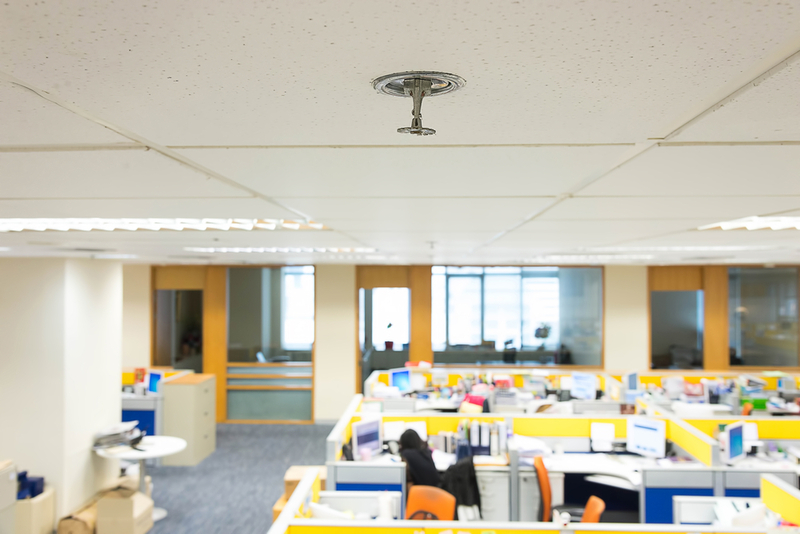 If you are looking for a completely new system, Koorsen Fire & Security can also provide the design & installation for your new fire sprinkler system along with the necessary maintenance. Koorsen Fire & Security has been providing the best quality service and materials to businesses for over 70 years. Contact one of our fire protection experts today.